Please refer to our stock # OVW967 when inquiring. 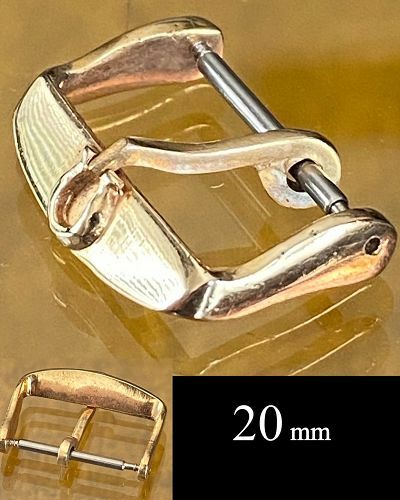 Vintage OMEGA 20mm Logo Buckle Yellow Gold Plate Bombay Style. Largest size of any Omega Logo Buckle. Created especially for the 1970s SCUBA MODELS 20 and 22mm strap size, which requires this width. Very scarce, subcontracted by an authorized Omega Dealer early in the 1970s. This buckle completes your Seamaster Dive watch and adds value. Very scarce. THIS IS A FINE COLLECTIBLE. DON'T INVEST IN THE STOCK MARKET. BUY SOMETHING PROVEN IN TIME. NOTE: We have been selling vintage watches on E-Bay since 1998 as watchco1974 with over 8000 vintage watch sales and 100% positive feedbacks. You can buy from us with confidence.